I want to let my users get to using the website as fast as possible, so I want to have as minimal a sign up as possible, using progressive profiling to get information later if they want to disclose it. From the home page, click "sign up"
Later you can go to your email and confirm your account by going to the link in the email and creating a password for your account. It seems to me this is the simplest signup that gets you started using the website with the least amount of effort from the users. Can this be simplified? Are there other tried and true minimal sign-up models? Stripe.com (a payments processor) offers an even more "immediate" sign-up process - they allow you to skip it all together. Any guest can begin using their dashboard and begin customising settings, testing mock transactions and making customer profiles before entering any sign-up information. No username, password or email. It's only when you want to go live and actually use the system to accept real payments do you need to create your account. Several other sites I have used before utilise similar flows: allow guest users access to as much of the platform as possible, even saving settings between sessions with cookies, before requiring any personal information. More work for the developer, but a much faster and "invisible" process for potential users. Home page promotes the call-to-action "Begin" (or somesuch), or "Signup"
Begin takes visitors to a version/mode of your site as capable and complete as you can possibly make it before any long-term persistance is needed. This serves a few other purposes: a) a consequence-free introduction to your system (so much effort is put into pre-signup marketing, such as screenshots, etc., why not make your actual site the promotion), and b) an incentive-building time, where visitors have the chance to create their own content, and therefore, reason to return. 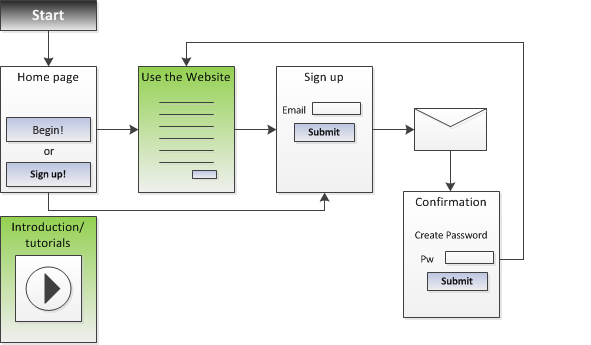 Remind the visitor they need to signup before their newly-created content can be saved. Long-term persistance is made by signing up, and you can begin a normal signup flow, taking the user back to their existing content (or allow them to clear it and start fresh). I've drawn the diagram which could give you some insights. 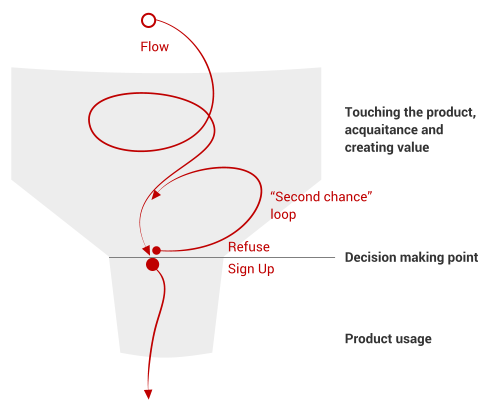 So your task is to design flow, that leads user to a decision point. Some acquired value and good experience before asking to Sign Up could create relation to a product or service and loss aversion effect. Still, if it isn't gained yet, user has a second chance. product time usage (e.g. > 10 min). function calling (e.g. saving, sharing, downloading, etc.). feature limits (e.g. < 3 brushes in paint tool, etc.). storage space or time limits. I agree with BrianN's answer: skip the registration-first step. Here is an extended explanation of why this works best, which I feel complements his answer. Getting as many active users as possible. Do whatever needed to try out the product/service. At this stage, he may terminate the process if "whatever needed" requires too much in terms of effort, money, or loss of a feeling of security (e.g. by giving up sensitive information). Actually try out the product/service. Decide for or against further use. 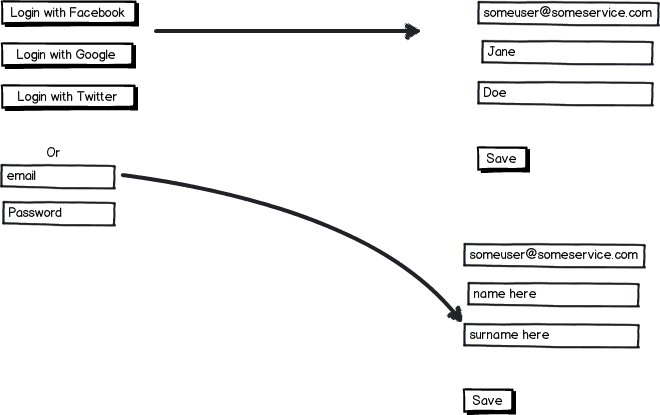 If decided for further use, do whatever necessary to incorporate the solution in his/her workflow. In a try-first solution, this process is supported in its details. Sign-up happens at Step 5. In a sign-up-first solution, the site does not fit the process so well. But users will act as users always do: they will bend the software to fit their process, not the other way round. So, they will still follow the process above. Sign up now occurs at step 2. And the decision for or against your software occurs at step 4. All the newly decided-against users end up with an account for your service/product. This does not make them decided-for users, and they will not return to your site later. Can you tweak something about the sign up to make a decision-for more likely? No, you can't. If you make the sign up very low effort in the terms described above, it doesn't create any commitment in the user. If you raise the effort required, you increase his commitment, but you also increase the proportion of users who will terminate on Step 2. And while I have no numbers for that, the industry trends of decreasing trying-out barriers (which probably prompted you to create the question) seem to confirm that the increase of terminating customers is disproportionally high. And does the try-out-first method hurt your relationship with the users who were decided-for before they came to the site? No, it doesn't. They actively want to sign up; the only way a try can stop them from doing that is if they find out that they were mistaken and your solution is not good for them. Those people would have become inactive after signing up anyway. Bottom line: You can't force users to do something they don't want to do. If they don't want to be your active users/customers, they won't be, no matter if they signed up or not. So keep the sign up for those who have decided to stay with you, and let the others try first. 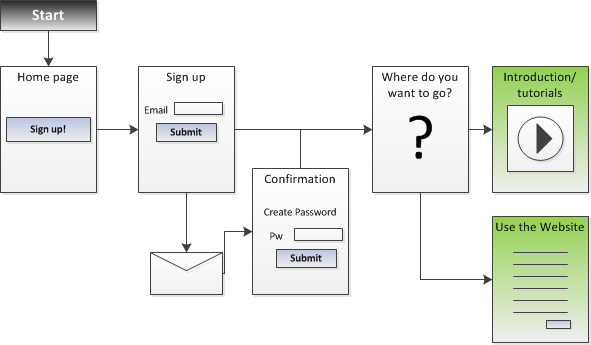 With OAuth (facebook, twitter, Gmail intergration) you can grab the user's email address from whatever service you used to sign them up from and allow them to change it of they want and then they press save. That way, if the OAuth service provider decides to charge or discontinues the service you still have an email address that the user account is linked to and can be authorized with. 3 steps could be simplified here. 2- Consider skipping the need for e-mail confirmation before you can use the app. Confirm it after they've started using it instead. You could still ask them to set a password at the confirmation stage "To be able to log back in to you account later". 3- Always land them on 'using the website' but give them an option in that UI to find tutorials if they need to. With all the above it would be: 1- sign up from homepage. 2- immediately see the 'use the website' pages. 3- confirm e-mail and create password later on. This would have a nice benefit of the create password step being a rudimentary "activation" metric for tracking whether people are interested enough in the site to keep using it after their first try. Useful! Forgive me for answering with questions. How does it email you before it knows your email address? And why would a user want to "sign up" when they don't know anything about your site yet? Why does this have to be a separate form? Why does it need to ask you this? Can't it just start with the first tutorial, and offer a skip link (or vice versa - start with whatever the site does, and offer a tutorial link). Who wants to watch a tutorial when they don't know if they need it yet? Let people start using the site, and if they run into trouble, give them help. Also, if people need a tutorial to use your site, you have bigger UX problems than your signup process. 5. Later you can go to your email and confirm your account by going to the link in the email and creating a password for your account. Best solution is clearly no signup before the need to save. But if a signup is required, SQRL is a promising new idea that would fit your criteria perfectly. Only, it has no implementations or even a locked-in specification yet, so it's futureware. So far. Have you considered using Facebook/Twitter profile integration? This is by far the quickest way to sign up to a website/app that I've seen. Simplify. Make it possible for the user to see the tutorials and explore the website. When they start to feel like a regular user, give them a reason to sign up. You can gather information about the user during this exploration of the website. You should see the sign-up process as a casual conversation that is in fact an interview. This could replace the sign-up information fields with just a sign-up button. Example, during the tutorial: "Welcome, to whom do we have the pleasure of speaking to? Fill in firstname." Not the answer you're looking for? Browse other questions tagged registration conversion-rate simple easy minimalist or ask your own question. Is it better to force sign in before or during restricted forms? What is the best approach for dealing with new users once they have provided their initial sign up info? Any suggestions for letting user Activation by clicking link OR typing in confirmation code?